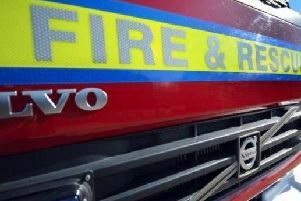 The fire service was called out to Daventry after a man got stuck on his scooter in a flooded underpass. The alarm was raised shortly after 2.30pm after the elderly man’s mobility scooter broke down in one of the underpasses at the bottom of Ashby Road. The underpasses there are known to quickly flood several inches deep during heavy rain – such as the town has experienced today. The fire fighters helped get the gentleman – who was uninjured – and his scooter to dry land.